It wasn’t the talk he was supposed to give. At the Deconomy conference in Seoul, South Korea, on Wednesday, ethereum creator Vitalik Buterin scrapped a plan to discuss his 12-month vision for the world’s second-largest blockchain, opting for a more general discussion on blockchain and its potential. That said, the discussion with fellow ethereum research scientists nonetheless gave a window into how the 24-year-old founder believes the platform needs to change in order to accommodate the growing levels of interest from developers. Most notable were Buterin’s frank words about ethereum and the low number of transactions it can process currently, a barrier that has been made apparent by the creation last year of the platform’s first widely popular applications. As profiled by CoinDesk, the ethereum network has been increasingly bumping up against its network capacity limit in the aftermath. As such, Buterin told attendees that anyone seeking to build a “decentralized Uber” or similar application today would likely be frustrated. While the ridesharing giant sees 12 rides a second, ethereum processes just 15 transactions per second, according to his estimates. That said, Buterin’s talk also focused on possible scaling solutions, including sharding, a proposal that would split up ethereum’s blockchain, recording parts of its data store separately. Still, while he didn’t disclose a possible timeline for rolling out the solution, Buterin said he sees the barriers as more social and cultural, owing to the complexities of blockchains today. 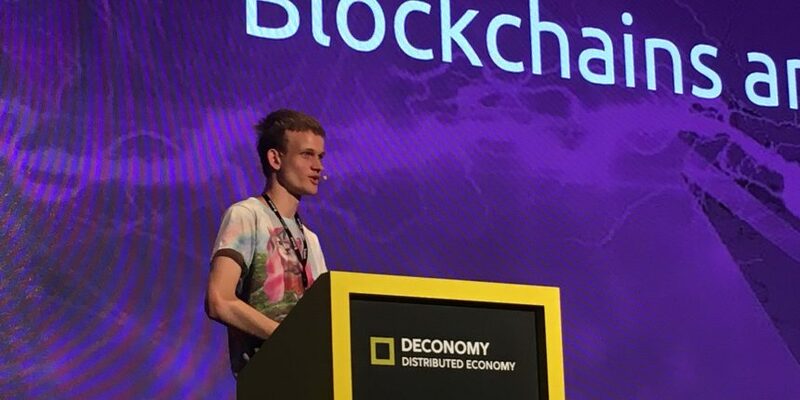 “You try to read any Wikipedia article about any math topic, it’s just bunch of incomprehensible formula of mumble jumble,” Buterin said.